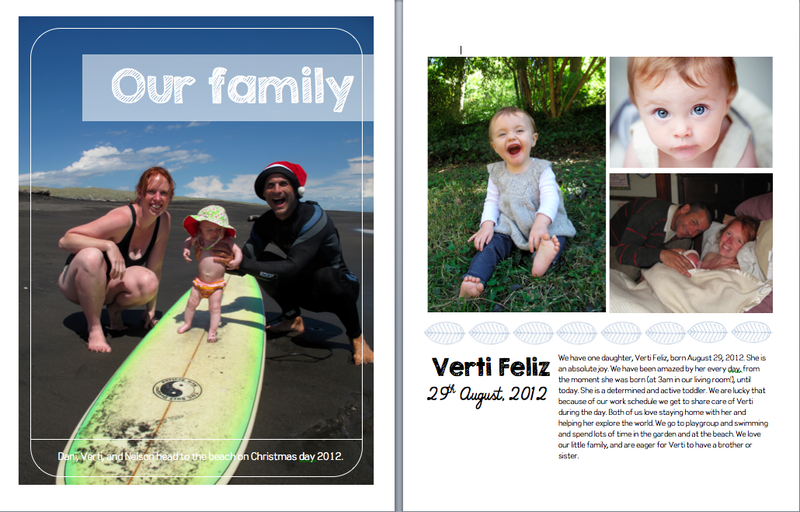 Today we printed out the final draft of our family profile book for one last edit before we submit it on Monday. This is what birth parents and social workers will look at to determine if we are a good match for their child. They don’t get to meet us or talk to us. Just. This. One. Book. Can you say nerve-wracking? I seriously spent about 5 hours deciding on fonts. Don’t even get me started on pictures. And the words?? Honest, but not too honest. Selling ourselves, but not fake. Greenies but not too hippie (nah who are we kidding, we could never cover that up). I mean should we tell them that one time we composted a goat? Probably not. And now its done. All 40+ pages of it. All 150+ pictures. I can’t post all of it because they ask some pretty darn personal questions (fair enough). But I’ll post a few pages so you can get a feel for it. Text is based on a list of about 50 questions we were given by the social worker. 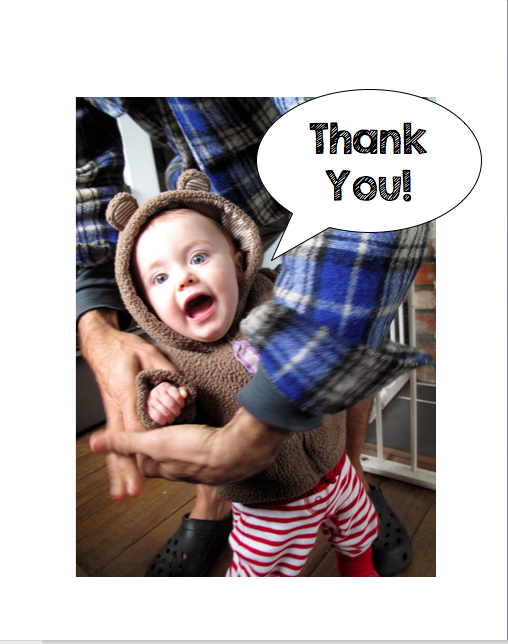 It was very difficult trying to pare down everything we wanted to say to birth parents into concise paragraphs. 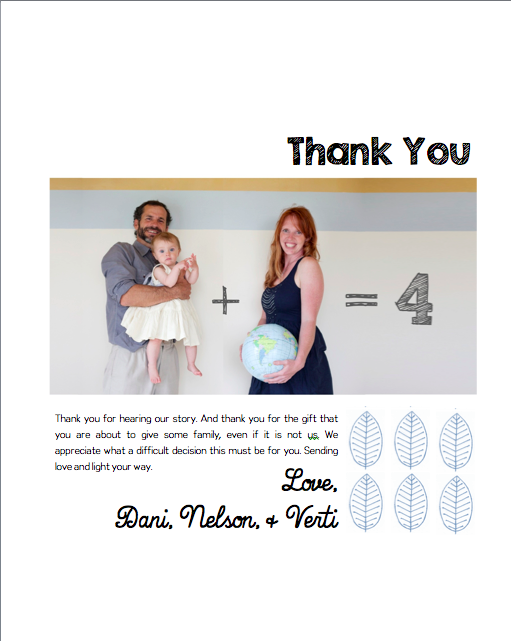 Because really what we wanted to say was “We will love this child so much, and are so appreciative, and look how cool we are, and we are really nice people.” But we felt like that wasn’t quite grown up enough. In the end this step in the process, like every other step so far, was a blessing. Allowing us a chance to reflect and learn as a family, that we otherwise wouldn’t have had. I mean how many times do you, as a couple, get to sit down and really think about the fibers that make up the fabric of your marriage? How many opportunities do you get to articulate your parenting philosophy? Or the goals you have for your children and family? To sit and really define what your important events and traditions are? To pinpoint who you are as a family? 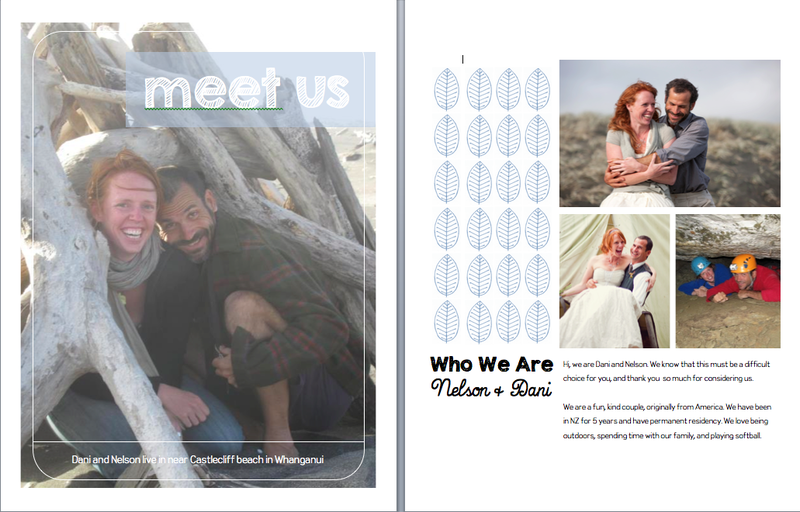 So, if you have about 100 free hours on your hands, I highly recommend sitting and making a family profile book for yourself. It won’t disappoint. 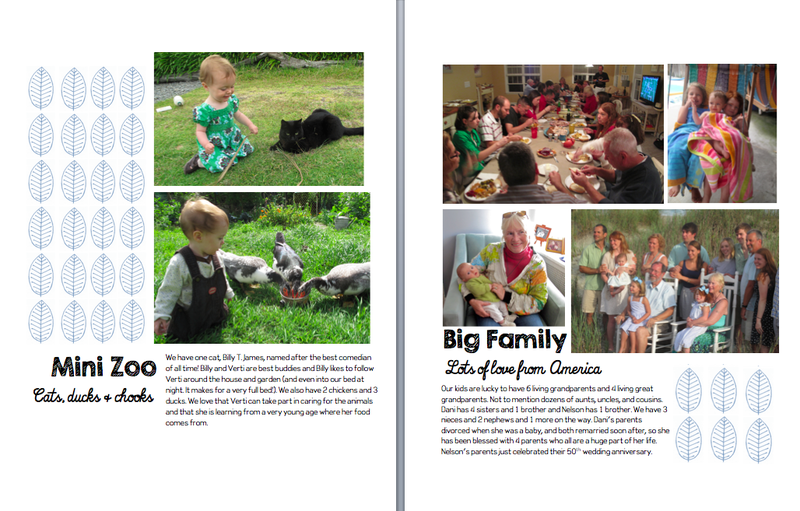 PS- for all you font-ophiles – in the end I went with KG Secondchance Sketch for the Headings, That’s All Folks for the Subheadings, and Tin Birdhouse for the text.